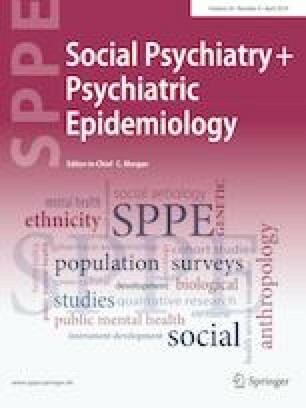 A substantial body of research indicates that self-stigma is associated with poorer outcomes related to recovery among people with severe mental illnesses. 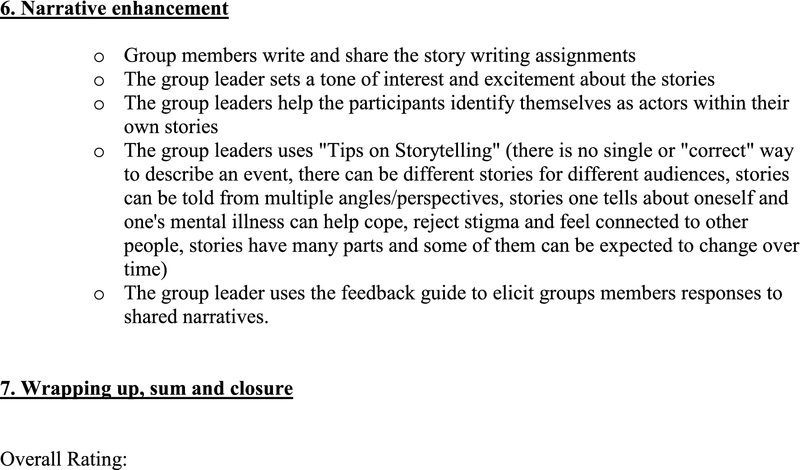 Narrative Enhancement and Cognitive Therapy (NECT) is a structured, group-based approach which targets the effects of self-stigma. A randomized-controlled trial was conducted to examine the efficacy of NECT. 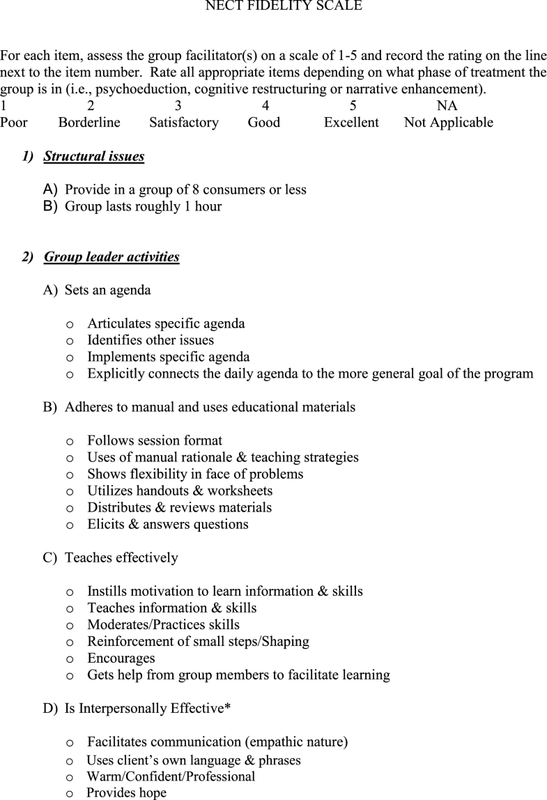 One hundred and seventy persons, recruited from both outpatient and comprehensive treatment settings, meeting criteria for schizophrenia-spectrum disorders and moderate-to-elevated self-stigma, were randomly assigned to NECT or supportive group therapy and assessed at four time points over the course of nearly a year. Participants completed measures of self-stigma, hope, self-esteem, functioning, psychiatric symptoms, coping with symptoms, and narrative insight. 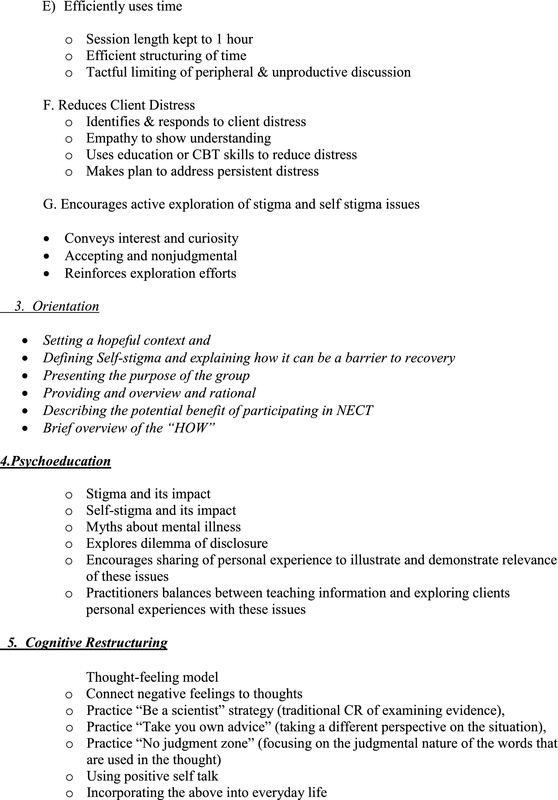 Analyses indicated that NECT participants in outpatient sites improved significantly more over time in self-stigma compared to supportive group therapy participants in outpatient sites, while NECT participants in comprehensive (including day treatment and psychiatric rehabilitation program) sites improved significantly more in hopelessness and narrative insight than other participants. NECT participants as a group showed decreases in the social withdrawal component of self-stigma, decreased in their use of avoidant coping strategies, and were more engaged in treatment than supportive group therapy participants. There was no evidence for effects of NECT on social functioning or psychiatric symptoms. Findings suggest that NECT primarily impacts self-stigma and related outcomes, and that the degree of its effects is partially dependent on the treatment context in which it is offered. This work was supported by the National Institute of Mental Health, 1R01MH0094310.